Here's the newest seafaring creature to grace the halls and NOT the kitchen of LabLinoleum, Crabius Maximus! This crab is definitely king, sporting 600 yards of single crocheted Cascade 220 and measuring about 30 inches in diameter (tip of claw to tip of claw). He's constructed in two parts (top shell, and underside with appendages) which are sewn together upon completion. Building on the lessons learned regarding segmented crocheted scorpion claws, I was able to perfect the process while practicing on this guy's ten appendages. As such, this pattern is definitely one I will build upon in creatures to come. Speaking of patterns, I am in the final stages of pattern testing the jellyfish. So folks, get your hooks and your Koigu ready for action! Must to have Crabius Maximus! Being from Baltimore, all things crabby are good. And he's cute. I must have him. Oh my...I really want to know how you did the segmenting. That's really awesome. Oh goodness, my oldest daughter would love that! She is nuts about crabs. My goodness, that's a large crab, lol. Damn woman! That's fantastic. 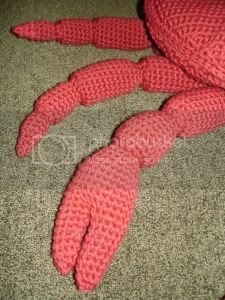 Really puts my little amigurumi crab attempt to shame. Serious, head-bowing shame. Oh, I really hope you'll come up with a pattern for the crab! He's adorable, and he'd look so good up on the wall of my bathroom, with the cross-stitched crab and shells! Oooo! I want to make a jellyfish! Pleeeeeeeze! but he better watch out for those nasty seagulls! ha i'm having so much fun! BTW who do you have test your patterns? Ze leetle crab eez perfect! C'est superb! C'est marveleux! C'est magnifique! I am the crab...moonchild...cancer, etc. Wasn't I with you when you bought that gorgeous coral Cascade? Brilliant, Your Ladyship! Can't wait to see some patterns. Really digging citizen snips here. It just dawned on me that this would be a nice gift for my friend. 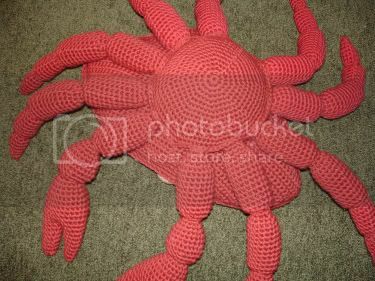 She is a cancer (birthday in June)... too bad I can't crochet. Awww....I'd have thought for a King Crab he'd have a little crown! As always, another wonderful creation from you! I recently discovered your site, and I love your work! This may be a question answered in your archives (which I haven't had a chance to read yet) -- but are your patterns available for sale? You are truly creative. Too funny! Its quite entertaining that my family has dubbed me the Crabius Maximus, how weird is that? It all started with a vacation to Maine and a krinkly little metallic stuffed crab. I love all things crab and this is a fine homage to the little crustaceans. Nice work! Hello, I'm from Brazil. A friend of mine indicated your blog to me and I really loved it. How is it that you can keep creating things that are at once totally bizarre and totally irresistable? 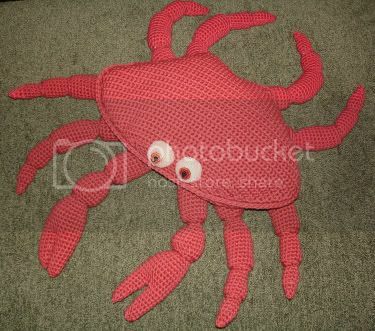 I would never think that I'd NEED a crocheted crab, but I am finding myself coveting it. Amazing job on this guy, he's very handsome. you should totally sell your patterns. Ooooooh, I love love the Crabius. He better hide when Donna sees him, LOL - she'll kidnap him for sure. What a cheering thing to see on a day when I, myself, am crabius maximus! I'd love to hear more about the jellyfish -- what a fabulous pattern! He's awesome! You've done it again and I must say I think he's my favorite, too. A very beautiful Crab o cangrejo. It looks like something you fins in a Disney Store. Very nice looking , I adore the color. amazing as usual. you could have been an engineer. i have no clue if i could make the jelly fish, but it has given me some amazing ideas for fine art pieces with jellyfish in other media. i lurve it so much. it speaks to me. Ah crustaceans, the entertainers of the sea! Oddly enough I just recently painted a lobster in love. Must be something in the air. A french cousin to Crabius Maximus.. I am loving the crab :-) Excellent claws! Lovely crab, you did a great job on him! Everything is sexier in crochet! is it possible to get a copy of the crabius maximus pattern? I'd be happy to pay. hi everyone... i'm in the middle of doing the adorable "crabius minimus" pattern. its actually my first time following a pattern at all, and i'm completely stuck at one point in the directions... has anyone done this pattern that might be willing to explain something to me? thank you so much! can I have a copy of this patern of this amazing crab?